50 FUN-DEAD LEVELS: Conquer all 50 levels of Adventure mode — through the day, night, fog, in a swimming pool, on the rooftop and more. Plus fend off a continual wave of zombies as long as you can with Survival mode! NOT GARDEN-VARIETY GHOULS: Battle zombie pole-vaulters, snorkelers, bucket-heads and 26 more fun-dead zombies. Each has its own special skills, so you’ll need to think fast and plant faster to combat them all. 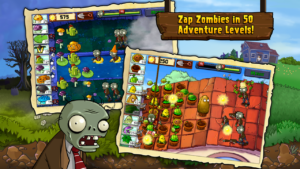 SMARTER THAN YOUR AVERAGE ZOMBIE: Be careful how you use your limited supply of greens and seeds. Zombies love brains so much they’ll jump, run, dance, swim and even eat plants to get into your house. 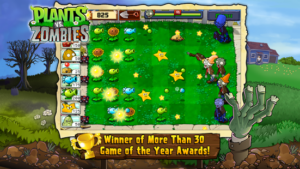 Open the Almanac to learn more about all the zombies and plants to help plan your strategy. FIGHT LONGER, GET STRONGER: Earn 49 powerful perennials as you progress and collect coins to buy a pet snail, power-ups and more. GROW WITH YOUR GAME: Show off your zombie-zapping prowess by earning 46 awesome achievements and show off your zombie-zapping prowess. COIN PACKS: Need coins for great new stuff? Buy up to 600,000 coins right from the Main Menu. Turn off data or wifi.